If this blog had a mission statement it would be helping families make tasty dinners and memories around the dinner table (or something like that). This recipe meets all the criteria – it’s easy to make, terrifically tasty and needs little input during the homework/bath time/witching hour . My crew love lamb shanks. They can be a bit pricey, so I keep an eye out for when they’re on special and freeze them to cook on evenings I think we’ll need warming from the inside. 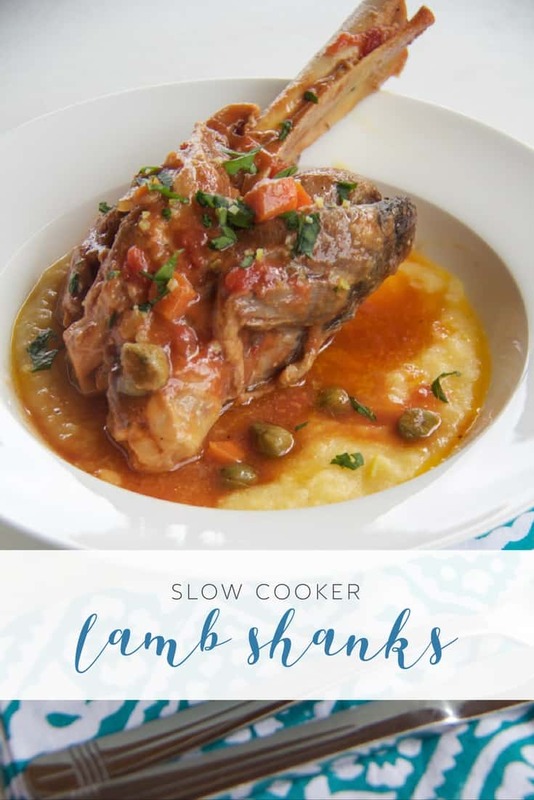 The key to great lamb shanks is cooking them low and slow, so the connective tissue has a chance to soften and the meat falls off the bone. I fell out of love with my slow cooker when I became a stay at home mum, but we’re rekindled the romance recently. There’s seriously nothing better than being able to roll a warming dinner into the shivering girls soon after we walk through the door from swimming lessons. Capers and gremolata give these slow cooker lamb shanks a fresh lift. Best of all they're easy to make and terrifically tasty. Add the flour to a plastic bag, season with salt and pepper, then add the shanks one at a time, shaking to coat the shank in flour. Heat some olive oil in a large fry pan and brown the shanks on each side. Don't rush this step - browning the lamb shanks adds lots of flavour to the dish. Once browned, add the shanks to a 6L crockpot. Dice the carrot and the onion. Mince the garlic. Add the carrot, onion, garlic, chicken stock and tomatoes to the shanks in the crockpot and cook on high for three hours. After three hours, stir the shanks, add the drained capers and cook on low for a further hour. Taste, season and serve on cheesy polenta topped with fresh gremolata. Combine parsley, lemon zest, garlic and anchovies in a food processor and blitz until finely chopped. Sprinkle on top of lamb shanks before serving. This is the first post using the my new recipe layout. Using the buttons you can adjust quantities, switch from metric to imperial and print your custom recipe. In keeping with my imaginary mission statement, I’m hoping it will make adapting my recipes to suit your family even easier. If you have any feedback on the new format, I’d love to hear it. does your crew love lamb shanks? do you use your slow cooker often? I have four shanks (bought at half price) and I’ve been waiting for the right time to cook them. I just don’t think my fussy bums would eat them so might wait until we have people over for dinner, in 2029!! !